I’ve been meaning to do a Dizzy review for yonks, and R.M. on the forum kinda spurred me into writing this. 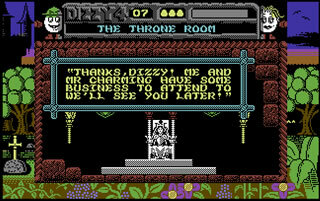 Dizzy was a huge franchise in Europe during the 8-bit era of computer gaming. Dizzy was simply an egg, with arms and legs, who usually got roped into doing adventures, saving his family, the world, his home land, that sort of stuff, and he featured in a number of games accross the Commodore 64, Amstrad and Sinclair Spectrum. Critically, the games were voted as above average, but commercially they were a huge success and became a mainstay of Codemasters’ early library of games. Not least because they were pretty good, and also the sheer amount of them. Hence me finding one to review first. In the end I plumped for Magicland Dizzy. Personally, this one isn’t my favourite – Bubble Dizzy gets my vote – but this was my favourite “Dizzy Style” Dizzy Game. Incidentally the first one I bought. The Dizzy series could be split into official games and spinoff games. The spinoff games explored a number of different styles of game, whereas the official games followed the same style of adventure games, with Dizzy negotiating platform areas to the game, as well as collecting items to solve puzzles. The puzzles aren’t particularly hard (anybody with a basic knowledge of fairytales will figure them out), but it’s tricky and unforgiving platform elements that turn this game from a kids cartoon adventure into a game that’s devilishly hard. Magicland Dizzy is the fourth. Rescuing Dora means she bumps uglies with the Prince. Apparently. Why do I like this? Well first of all this is the only Dizzy adventure I actually completed, so it is probably the easiest. For most games, ease of completion would worry you. However, this game is still blooming tough. The second thing is by this game they were well aware of their target audience, and therefore it isn’t just kids. There are little glimmers of adult humour. Nothing rude, but clever. One example is when Dizzy, first encounters Daisy – his girlfriend, who has been turned into a giant, and is trapped in a room because of it. The first thing Dizzy mentions is Daisy’s huge waistline. Furthermore when you find the “Drink Me” potion, it’s actually a hard liquer, that Daisy promptly gets a little tipsy on. Daisy then asks Dizzy for his hand in marriage, with our intrepid hero stalling at an answer. Again, it’s not sweary or smutty (the worst is when you cannot get into the Prince’s bedroom after you rescue Dora by getting the Prince to kiss Dora, who is a frog), but it’s quite clever, and it works well – Shrek did a similar thing a number of years later. Finally, the music. I find SID Tunes (the common name given to C64 tunes) very hit & miss. Some are awesome (Bubble Dizzy), some not so much. Magicland’s one is a big hit, as it has an enchanting (no pun intended) melody . Thanks for the review, I’ve linked to it over at the ‘Walkabout!